Hello, just little update on what’s new in Emmhouse. This is my beautiful Angel (age on picture one day). She celebrated her fifth birthday couple of day’s back. Until I had baby, I didn’t realize how time flies when you having fun. I really like this setup on my favorite Attic24 blog. Inspired, I made little shelf of fame for my little Angel’s birthday. I was cheating with this one – I bought it for our little home party. Those moments makes me rather upset, no big family. Everybody’s in England. Thank God for Skype. But Angel was very exited; she didn’t even want anybody to cut it. I had a forty plus something more! Birthday as well. I wasn’t as exited as Angel though. These kinds of roses, in these colors are my most favorite ones. Now, a little progress report on my curtain under Angel’s bed. It looks.., well colorful. Every morning before I take her to nursery, she picks the colors for next row. That makes her feel a very important person, she’s the designer. My ripple blanket is growing as well. Maybe not as fast as I would like it to, but we’re getting somewhere. This time of the year it should be around 0°C and start snowing, instead, while walking through the park yesterday, we found these beautiful roses, and we really liked them, even though Angel’s praying for snow everyday. Last year she was deprived of it, we all were, because we just didn’t get any. I don’t remember this ever happening, even in this relatively mild part of the country. Main thing I would like to write about today, are the baby blankies. This one is one of my favorite ones. I found circle shape on Ravelry, there are so many of them, and I put it together the way I liked it. I'm very pleased with the result. It'll be nice gift. I used 320 grams of cotton. Tapestry needle. Pattern notes: Squares are worked in circular crochet method, beginning at centre of the circle and ending up with square. Slip stitch join at end of each round. Don’t turn, but continue in same direction. Start with colour of your choice. -I changed the colour here and crochet into back loop of the dc’s. You can start anywhere. Holding the wrong sides of the Squares together and working in both loops of both squares for each st, with colour of your choice, join with sc, leaving one ch between the squares. It was better for me to join the squares on longer side first. With right side facing you, join colour in any corner and sc all around. For corners crochet 3sc, joins sc. I just like to apologize. Some of these photos aren’t perfect. They were taken while ago for me, as a reminder, not for display at that time. 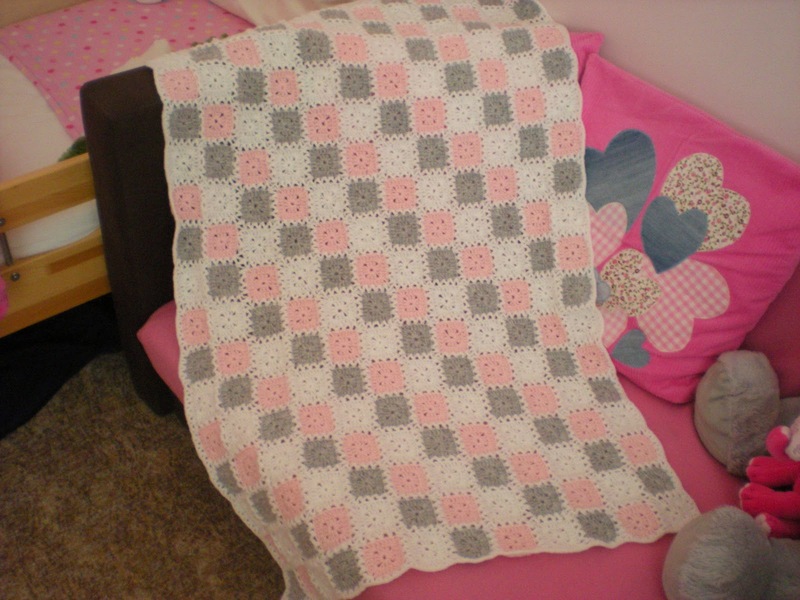 This light pink blankie I did for my now one-and-half year old niece. She’s real fighter from day she was born. She was born little bit early, weighting 930 grams only(2lb 0.8oz), yes, you reading correctly, not even one kilo, but she pulled through without any major problems. The pattern is free from Ravelry. On these two pictures you can see Little square blankie, my first handmade thing, for my Angel. Pattern’s from Sucrette - "Kaleidoscope blanket". One with bit bigger squares, but similar colors. And I’m happy to write that I did not make only this one from the same pattern. Mummies I know from around liked it very much, so there is couple of others in some slightly different color designs I made for them. When I found out our temporary living here is becoming more permanent, that I originally thought, I was very upset and homesick. After while I decided it`ll be better to occupy my mind with something creative. Thanks to my Grandma I always crocheted, knitted and cross stitched, so I started to make our home more homely. With help of my little Angel, I started with dressing up her room into brighter colours. In one Charity store I found pink Manchester Curtains-150cm x 250cm, 2 pieces, together cost me around £3. I had to buy it. On first pillowcase I put Union Jack, using ribbons and left over cotton fabric I found at home. I put hearts on second pillowcase. I found very nice hart shapes in Angels colouring books- just copy it on fabric and saw on pillowcase-using bits of fabric from home supplies. Third pillowcase was more my cup of my tea, since I’m not master of the needle. Again a Union Jack motive, I bought a crochet pattern I liked from Ravelry. The pattern for "V-stitch" blanket I found on Sucrette blog and it turned out beautifully. Not exactly my choice of colours, since I’m rather conservative, but my little Angel put them together, the way she likes it. After all who am I? - Her room, her choice. I was so excited working with that pink fabric, that I sewed curtains under Angels bed from it as well. It provides nice storage space for toys (she’s got to have some special spell to make the toys multiply over night, I don’t understand where we got so many) and it looks different than all the curtains you can buy. I secured them with Velcro, so they can be washed. For the opening we came up with something special. At first I like to put strings of crochet balls or pom-poms there, but I figured out, that wouldn`t be safe or practical enough. On Ravelry I found some squares, adjusted them little bit to my needs, crocheted them together, and now I’m working on it. Originally they should be only pink, but on the picture below, as you can see, I was outvoted again. I'll keep you posted on our progress. My Angel didn’t like to get rid of her baby chair, so I tried to dress it up little. That pink fabric seems to be endless. The round chair is standard Ikea model - I cover it with crochet circle shape with little flowers. This picture is little bit “tired” already, but my Dad brought it to me from one of his business trip to Paris, when I was around five years old, just like Angel is now. So it’s got special place in her room. What to say now? Just thank you Lucy from Attic24 for a fantastic tutorial - "Happy flower decoration". This picture is from my crosstitching days. We all need some sort of protection sometimes. After I saw so many beautiful ripple blankets, I had to start one by myself. Yes I’m not that adventurous with colours, but so far I like it. Thank you for visiting and reading. I like to show you along the way, that there isn’t only Prague or Vienna in this part of the World, but many other interesting places in the countryside, lovely towns and people who are trying to keep up the old traditions even in these busy modern days. I will keep you posted as often as I can. Bye bye for now. See you soon.